Some of the finest and most unique scenery in the world, and less people now than 100 years ago. 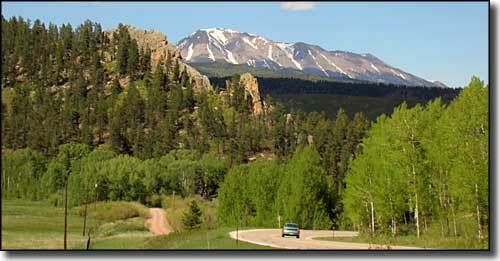 Highway 12 was designated as a Colorado State Byway in 1987 and as a National Forest Byway in 1988. 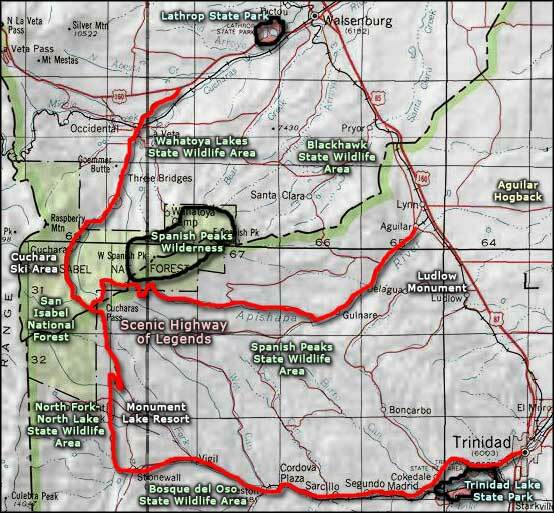 The Scenic Highway of Legends starts at the cities of Trinidad, Aguilar and Walsenburg and circles the Spanish Peaks. The Byway takes visitors through the San Isabel National Forest and crosses the 9,994 foot Cuchara Pass and the 11,248-foot Cordova Pass. The Byway is home to unique geological, cultural and historic features and includes a myriad of legends from the Native Americans, the Spanish Conquistadors, and the pioneers, miners, trappers, and ranchers who explored and then settled this region. State Highway 12, the Scenic Highway of Legends, ties together an area rich in Native American and Wild West lore. 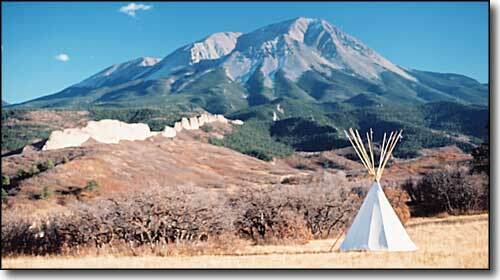 The Tarahumare Indians believed the Spanish Peaks to be the place where all life emerged on Earth. They tell stories of their Great Prophet Grandote coming here looking for water during a great drought. When the first Spaniard explorers came into the area they found gold near the Spanish Peaks. They enslaved a group of local Native Americans and forced them to dig more gold. When they had all the gold they felt they could carry, they killed their slaves and collapsed the mine on top of them. As the Spaniards headed out they went south over Cuchara Pass and down to the Purgatoire near Stonewall. Somewhere around there they were set on by a group of Native warriors and wiped out to a man. There are still legends of their gold being stashed somewhere in a river valley upstream of Stonewall. The Army of the West travelled through the Trinidad area, crossing Raton Pass to invade Nuevo Mexico during the Mexican War in 1846. 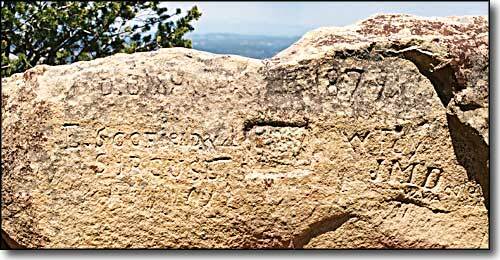 That's when Lieutenant Waldemar Fischer climbed Fisher's Peak and left his name behind (sort of). Just southeast of Trinidad, on Scofield Ridge, is a rock covered with the names and initials of Union soldiers during Civil War times. La Veta was first settled in 1862 by John Francisco and Henry Daigle, on land they bought from the Vigil-St. Vrain Land Grant. Francisco is reported to have said, "This is paradise enough for me," on his arrival in the Valley. Walsenburg was first settled as La Plaza de los Leones on the north side of the Cuchara River by Don Miguel Antonio Leon and a family named Atencio. Fred Walsen settled nearby and opened up his large mercantile in 1870. After Fred assisted in the incorporation of the town's 320-acre site, it was suggested that he be honored. The US Postal Service agreed and the town became Walsenburg. Las Animas County was known as a wilder-than-normal place for many years. On the occasion of statehood in 1876 the Governor was speaking in Denver, saying: "Colorado has become very civilized, except for that area around Trinidad." After Bob Ford shot his cousin Jesse James in the back and killed him for the reward, he came through the area. Bob was run out of Trinidad on general principles but he lived with his wife in Walsenburg for several years before moving on to South Fork and Creede (where he was killed by the Sheriff, grandson of a woman Bob had tortured and robbed back in Missouri). From this short blurb you can see that much of what was the real Wild West flourished in this area. And a lot of it has been preserved. Trinidad was rated by the National Trust for Historic Preservation as having the most (and the most restorable) Victorian architecture in the state (Leadville was a distant second). And it wasn't all that long ago that the best source of Championship Texas Longhorn breeding stock was here in the Cuchara Valley. Come and see for yourself: take the journey and experience some of what the first settlers came to call home.